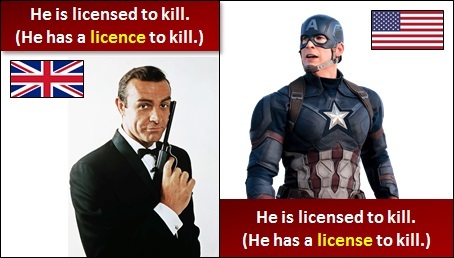 What is the difference between Licence and License? For those following UK conventions, you must know the difference between a noun and a verb because licence is used for the noun while license is used for the verb. If you're unsure how to spot a noun and a verb, don't worry because we have some tricks to get around this. Here is a short video summarizing the difference between licence and license. Try substituting the verb to allow with the verb to license to confirm it's a verb. "This restaurant is allowed to sell alcohol." As this sounds okay, licensed is correct. Try substituting the noun papers with the noun licence to confirm it's a noun. "May I see your driving papers please?" As this sounds okay, licence is correct. There should be no confusion with licensing or licensed. The endings ing and ed mean these are always from the verb; i.e., there are no such words as licencing or licenced in British or American English. In American English, license is both noun and verb.